Pucketts Recycling | Saving the world one bundle at a time! Recycle. Once is not enough! third generation, family-run recycling company. Pucketts Recycling has been servicing the Twin Cities since 1971. Everyday we strive to service our customers with a Midwest, blue-collar mindset. 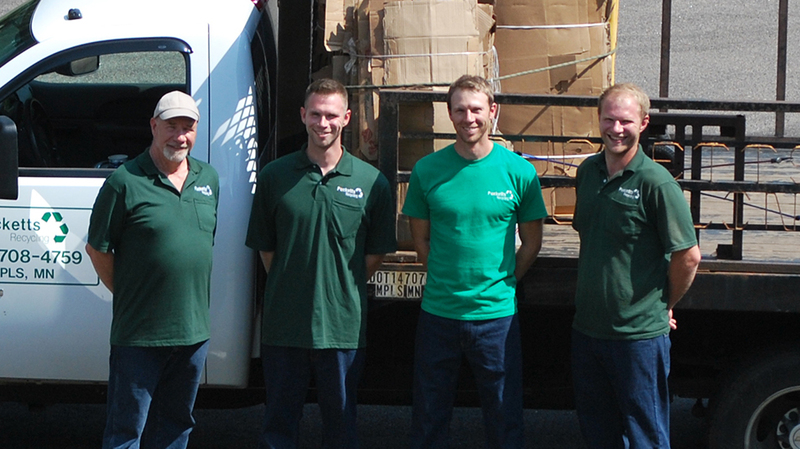 We specialize in hauling baled cardboard, loose cardboard, and our bundled cardboard. We operate low impact fuel efficient trucks which help limit the appearance that larger recycling/trash trucks can have when they operate in your parking lots. Make sure to check out our “The Bundler” an alternative option for cardboard recycling! We also provide scrap, corral, and metal recycling cleanouts and services. We set ourselves apart from the competition by offering a variety of differences: Low impact and fuel efficient trucks, affordable service charges that are upfront and honest, and through innovation and technology! If you’re looking for a different and unique company that offers alternative recycling solutions, then look no further. We offer a very unique and economical alternative to cardboard recycling! We offer all of our services to the Seven County Metro Areas. We operate low impact fuel efficient trucks. Need a hand recycling? Feel free to reach out to us! © 2019 Pucketts Recycling. All rights reserved.